Most of us enjoy smoking from those gorgeous looking water based pipes; relaxing in the company of shisha for an hour or two, giving little thought to what it can do to our body. Though shisha may be flavoured with your favourite fruits, it is basically tobacco that you smoke and it is toxic. If you regard shisha as just another form of smoking, with low risks, read on to know more about the ill effects of shisha. A World Health Organisation (WHO) report shows that shisha smoking leads to some very serious health hazards. Studies show that smoking shisha is equal to smoking 100 cigarettes at a stretch. 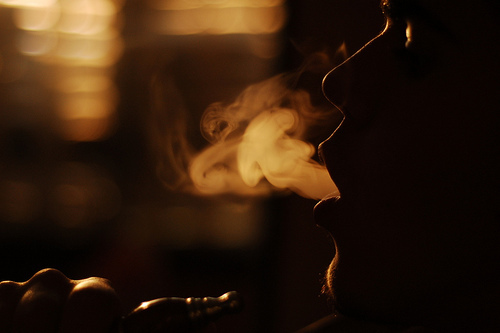 The liquid that you smoke is composed of flavoured tobacco and molasses. Molasses is responsible for the temptingly sweet taste and the clear cut smell. Flavours vary from rose to licorice to double apple. As inviting as it may sound, it is a shocking fact that the amount of tobacco the liquid contains is very high. Studies indicate that 45 minutes of shisha smoking is as good as smoking 50 cigarettes and the levels of carbon monoxide and nicotine in your body will be exceptionally high. In fact, it is twice the levels of carbon monoxide and thrice the levels of nicotine when compared to the levels of these chemicals from 50 cigarettes. These high levels of carbon monoxide may result in unconsciousness and brain damage. Shisha also exposes you to chemicals such as cadmium that is known to cause cancer. The reduction of tobacco causes the glycerine levels to shoot, which can poison your body. Though shisha does not comprise of harmful additives, the compounds present in it when burnt, release several toxic compounds, some of which cause cancer. Pregnant mothers who smoke shisha are under the risk of delivering underweight babies with breathing problems. Long term risks of shisha include high risk of cancer, especially cancer of the mouth, gums and lungs. Youth workers from NHS Stop Smoking Services, Leicester, point out that sharing the pipe during smoking, could spread certain viral and bacterial infections such as tuberculosis and herpes infections. It is therefore un-hygienic practice. According to Dr. Bassam Mahboub, physician and Vice Chairman, the Emirates Respiratory Society, shisha increases your blood pressure, thereby increasing your risks of heart attack. He also specifies that the pipe carries smoke directly to the inner areas of your lungs, causing serious harm. The WHO report reveals that shisha fosters addiction and it also has passive smoking effects, just like cigarettes. Tobacco in the liquid is present in an evaporated form and some studies show that the by-products from the evaporation process, which is stimulated by coal, increases your exposure to toxic substances. All these reports indicate the fact that shisha smoking is life threatening. It is not a safe substitute to cigarette smoking as people presume and there is no evidence to prove that the water filter used in shisha can reduce the exposure to the toxic chemicals. Smoking in general is injurious and there is no safe way to smoke. If you are a shisha smoker, it is high time you quit this deadly practice. Quit shisha and improve your personal health.